Investors not shy about investing in object storage, are they? Investors seem sold on the idea of Cleversafe's mad "terabyte-a-second" gobbling kit, so much so that the startup has received an injection of $55m to strengthen its big data and cloud-focused product and sell it more widely. The company received $31.4m in a C-round of venture capital funding just three years ago. Why does it need another $55m now? We suppose the better question to ask might be: How can it raise that kind of cash with such apparent ease? After we learned that it had recently scored a deal with the US federal government, we began to see the answers. 2004/2005 - Seven-figure seed funding from Chris Gladwin and four executives. Likely to be around $10m, although we can't say for sure. 2006 – undisclosed A-round – likely another $10m or so. 2006 – undisclosed B-round closed in December, led by New Enterprise Associates. OCA Ventures participated as did angel investors. Let's assume this was $10m too. Nov 2007 – C-round of $5m. Oct 2010 – $26.4m in a C-round extension. Aug 2013 – $55m in a "D-round" – which in El Reg storage desk's estimation is really an E-round. There is weirdness here. 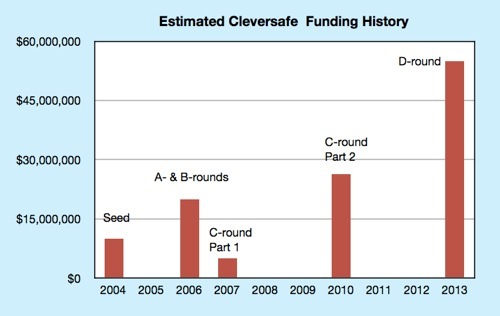 In 2006 there were two funding rounds, separated by just months, and called separate rounds because, presumably, Cleversafe's valuation changed. Then there was a C-round which brought in $5m in 2007, looking suspiciously like a top-up after an inadequate B-round the year before, and another $26.4m in 2010, three years later. This two-part fund-raising over three years is called one round because the company's valuation didn't change, but it looks like two quite separate funding events. El Reg: It seems that board chairman Chris Galvin cracked the whip earlier this year. Henry Feinberg joined the board in March and you became the new CEO in May. Now there is the fresh funding round. Why is this happening? Did Cleversafe need an infusion of fresh energy? John Morris: When you are building a successful company, you are always looking for ways to improve and accelerate growth. I joined Cleversafe in May because I have a particular expertise in helping companies grow. Our founder, Chris Gladwin is now vice-chairman and plays a critical role in shaping and honing our vision for the future. I bring experience in driving growth while building at scale for even more growth. I spent the last three months talking to customers and partners across the globe. And, universally, there is a growing recognition that there is a better way than existing RAID-based legacy storage to manage and handle ever-growing, large amounts of data, securely and reliably. El Reg: There was an experienced CEO before you: Jonathan Zakin from May 2007 to March 2008. Why will you fit at Cleversafe when Zakin did not? John Morris: I can only speak to the fit that I have with what Cleversafe needs today, which is hand in glove. I’ve been here nearly 100 days, but in that time, I’ve made very strong connections to our customers, our partners, and our people and we’ve accomplished a significant amount in that short time – closing this round of funding is one of those significant items. El Reg: Cleversafe's funding is a tad complex. Total known funding is $96.4m and I'm assessing the actual total funding as being in the $120m area. Can that be confirmed please? John Morris: With today’s oversubscribed Series D Funding Round, Cleversafe has raised over $100m in capital since our founding. I can’t comment on the details … but can tell you that there have been a total of four equity rounds – A-B-C-D. The C round was open for multiple closings but all at the same share price, which makes that a single round. ... Of note, with the funding raised in this round we are on track to be cash flow positive in the next calendar year. El Reg: Cleversafe has grown its customer base by 75 per cent in the last 12 months. This, to our mind, is a low rate of customer growth. Is Cleversafe targeting the high-end of customers object storage/big data storage requirements and thus facing a lower number of potential customers than, say, Amplidata, Caringo, EMC Atmos, Scality and DataDirect Networks? John Morris: Customer interest continues to grow. We’ve more than doubled revenue and customers in each of the past four years and we are seeing a substantial interest in our offering by companies that have traditionally been entrenched with legacy vendors and that now need a more cost effective solution for massive scale storage. multiple wins in the US federal government, including a strategic investment and technology development agreement with In-Q-Tel (the firm that identifies technology to support the missions of the US Intelligence Community) and a partnership with Lockheed Martin. As you can see, our customers are some of the biggest in the industry and their IT providers are leaders in the industry like EMC. While many of these customers have been well-served by technologies like RAID in the past, the fast growing need for unstructured data needs a completely different architecture and that’s what we’ve developed. With regard to emerging technology providers in the object storage space you’ve listed – we honestly don’t see them in the market and really don’t see much from them beyond promotional material. The legacy providers like EMC have designed products for yesterday’s storage needs, RAID, scale out NAS but I don’t think anyone else has even shipped 10 per cent of the volume we have. We’ve shipped more than 200PB which makes us far and away the leader in object-storage. El Reg: Has Cleversafe aimed too high with the result that its total addressable number of customers is too low? John Morris: Not at all. Our customers are typically those that need storage in excess of a petabyte. Prior, that may not have seemed as high an addressable number of customers, but I can tell you from many of the conversations I’ve had with both existing customers and partners and prospects over the past few months, that number is quickly growing.